The news that Facebook provided troves of user data to Cambridge Analytica is disturbing on so many levels. On the one hand much of this is not new - Facebook, Google, and others have been using data for years to target us for advertising, to shape their business models and more. This latest episode has lifted the rock to reveal some very nasty vermin. Facebook will be called to answer many questions including criteria for third party access to our data, the lack of due diligence on third parties, and the utter lack of follow through to assure that third parties are complying with data standards. What can we do to limit how our data is used? Short of deleting our Facebook accounts and staying off of Google, the reality is that our digital footprints are very difficult to hide. Information is collected when we search Google, click on Facebook pages, and even from our GPS. But here are a few steps we can take - however small - to limit the data that Facebook collects on us. 1. Never log into an app using your Facebook password/login information. Doing so links the app to your Facebook account, potentially providing even more data to Facebook such as your food-ordering habits on Grub Hub. 2. Resist the urge to share public posts. Facebook's data machine takes note each time we share those adorable puppy videos, amusing cartoons and political memes and news items. That information is used by Facebook advertisers to target 'sponsored posts' and more. 3. Don't. Take. The Quiz. Quizzes like these are at the heart of the Cambridge Analytica data breach. Even aside from this latest fiasco, the information you supply just feeds the Facebook data behemoth. 4. Check your Facebook settings to see what apps are connected to your account. (Go to "Settings" and then "Apps".) I was shocked to see that I had used my Facebook info to log into all of these apps shown below. Many of these logins were likely years ago as I have no recollection of many of them. I have since removed the connection between my apps and my Facebook account by clicking on the "X" that is to the right of each app listed. 5. Delete your account? Not for me, but this "nuclear" option may be tempting given the lack of trust we are all feeling. (At least for now, the social connections are outweighing my ire over the privacy issues.) 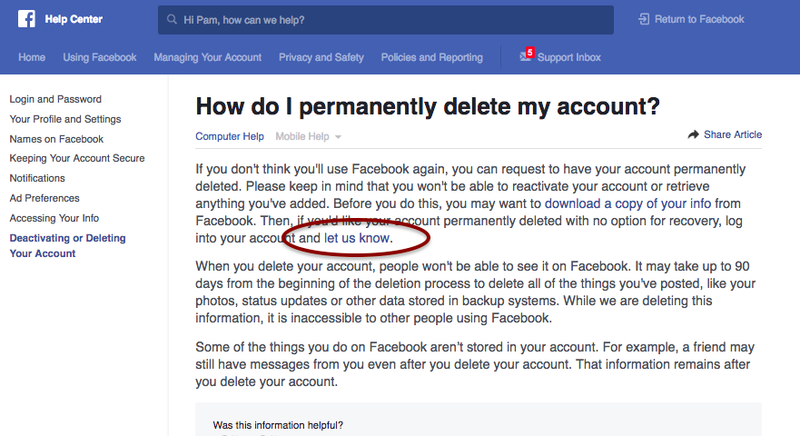 But Facebook doesn't make it easy to delete your account (not to be confused with the temporary "deactivate' option) To delete your account, go to the help feature and search "delete account". You then must click on the link (see below) "...let us know." If you are able to find it, that is.